Jack started playing handball in 1934 at the age of 20 and rapidly became an expert. He won his first Amateur Athletic Union (AAU) championship in 1937. 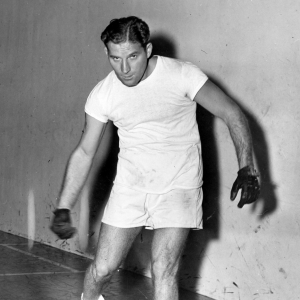 Thereafter, Jack won 20 Middle Athletic AAU Championships and 10 Middle Atlantic Doubles Championships, in a career interrupted by service in World War II. Following the war, Jack won the Junior National Singles and Doubles Championships in New Haven, Connecticut in 1946. He placed third in the National Senior Singles in New York in 1949, and won the Pennsylvania YMCA Singles Championship in 1950 and repeated in 1954. In a major national competition, Jack placed second in the National AAU-USHA Doubles Championship in 1952 in Detroit. He placed seventh in the National Singles Championship at Houston, Texas in 1953. Despite the handicap of several hip operations, he continued to play championship handball until his death in 1973. He was the recipient of many awards for the time and energy he devoted to his volunteer work. The 1978 Open Handball Tournament at the Germantown YWMCA was dedicated to Emas as the greatest handball player ever produced by the Germantown Y.